Now available for Android tablets and phones on the Google Play store! 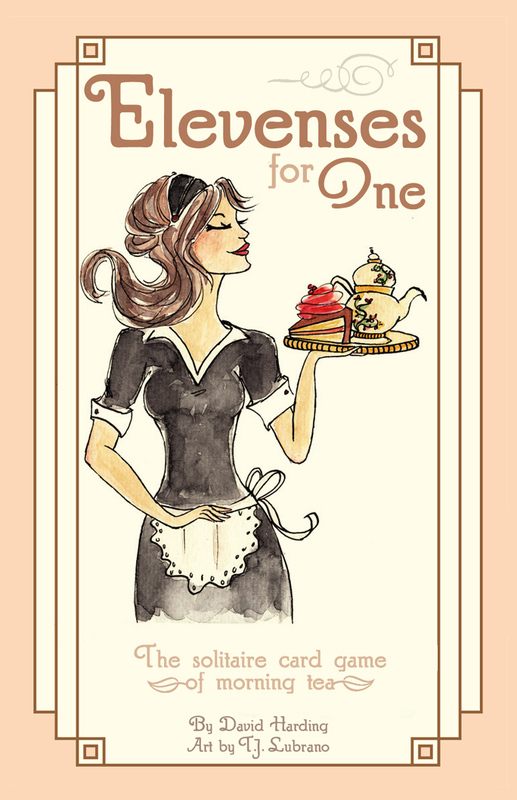 We are pleased to announce that Elevenses for One will be published in 2016 by Eagle-Gryphon Games as part of their EGG line of small games! You are Grosvenor, the maid to Lady Agatha Smythe, one of the wealthiest landowners in the district. She is holding a gala High Tea at 11 o’clock – but, oh dear! You only have 15 minutes to get ready and where is that sugar? You mustn’t be late! The madam’s reputation is at stake! Welcome to Elevenses for One – a game for one player who must load her Tea Trolley with all the accoutrements required for a splendid morning tea… before the clock strikes 11! A micro solitaire game with just 11 cards (each with specific actions the player must choose to follow or ignore – possibly to her detriment), Elevenses for One is a tense puzzle. Can you load the Tea Trolley correctly within fifteen actions? What are they saying about Elevenses for One?